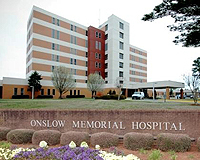 Onslow Memorial Hospital provides four different levels of care: Well Baby, Level I, and Level II (Neonatal Intensive Care), and Level III. The Well Baby Nursery can accommodate 23 babies that require newborn baby care. The Level I Nursery is designated for babies that require more comprehensive monitoring and observation and has a 7-bed capacity. The Level II (NICU) has a 4-bed capacity and provides care to neonates requiring intensive nursing and medical care. The Nursery is supported by a Board Certified Neonatologist and two Neonatal Nurse Practitioners. Safety and security of babies is always a priority. The Nursery also provides a transport team to pick up babies needing Level II Nursery care. Our Level III Nursery (Neonatal Intensive Care Unit) provides care to newborns with intensive medical and nursing care needs. This unit even serves other area healthcare facilities that lack advanced monitoring and care. Mothers also will rest assured knowing their newborn is always protected by our infant security system. Learn more.